Going out into the great outdoors is an incredible experience. Anyone who enjoys the outdoors also knows that there is nothing that can ruin that experience more than having to carry around loads of extra equipment. The ALPS Outdoorz Commander Freighter Frame and Pack Bag provides you with a pack that will give you everything that you need for those longer outdoor adventures. Not only do you have a spacious 5250 cubic inches of space in the pack, but you also have a freighter frame that can be used independently whenever you require. It’s the perfect piece of kit for those long hunting trips. The ALPS OutdoorZ Commander Freighter Frame and Pack Bag are, essentially, two great pieces of equipment. Therefore, in order to get a better idea of what you are getting, it’s possible to look at the two items separately and discover the features that each of them possess. There is also a hydration pocket and port for hydration systems. 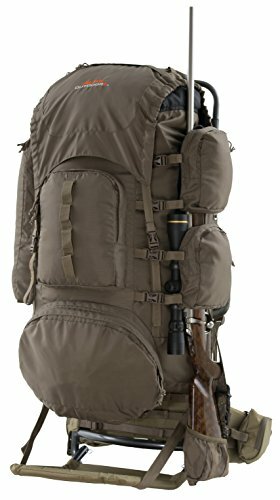 The ALPS OutdoorZ Commander Freighter Frame and Pack Bag is an excellent piece of equipment for those extended outdoor excursions and hunting trips. The pack is spacious enough to carry everything that you might need and tough enough that it will cope with the wear and tear of outdoor use. Comfort can be a problem when carrying a pack of this size, however the padded shoulder and waist straps and the mesh back band seem to fit the bill, helping this be a pack that you won’t have to think twice about for use on your next trip. However, though a great pack, there a few points where this pack falls short. The clevis rings tend to make a lot of noise as you move around, which means that they will have to be replaced with a less noisy alternative or fixed in some way so that they do not move around as you walk. There are also some customers that have noted that their straps have failed and broken when carrying heavy loads though this could just be a manufacturing flaw, rather than a design issue. 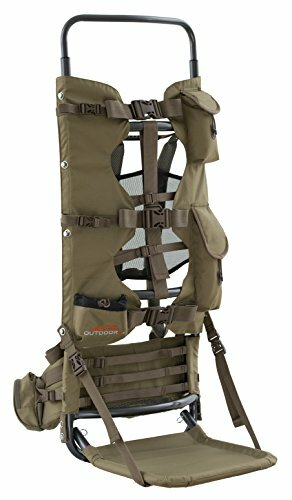 Overall customers have received the ALPS OutdoorZ Commander Freighter Frame and Pack Bag very well and it has reached an overall 5-star rating. Most customers are happy enough with the bag that they are willing to find alternative solutions for the small issues such as the noisy clevis rings. Spacious: You won’t find yourself fighting for space with this unit, an incredible 5250 cubic inches will make sure that you have all the space you might require to carry your gear. With a middle divider as well as bottom entry, you can even organize and separate your equipment in order of importance, allowing you to get to the equipment you need quickly and easily. A spindrift collar with drawstring closure also allows for that little bit of extra space at the top if you find yourself needing it. This pack also provides you with enough pockets for your smaller pieces of equipment, eliminating needless fishing around in the bottom of the pack. Even when used separately the frame has the pockets for your essential pieces of equipment. Thereafter, when out hunting or using the frame independently you find yourself with the option of extra space. The frame can be adjusted from 17 inches to a height of 23 inches and also comes with 3 extra extension lashes which will provide ample space for hauling any game or materials. Lightweight and durable: Constructed from a lightweight aluminum, the frame itself is strong and fairly lightweight. Combined with the pack, which is made from Nylon rip-stop, you have a pack that is lightweight yet tough enough to survive anything that you throw at it. Just what you need when you spend a significant amount of time out in the bush. Comfortable and adjustable: Comfort is of the utmost importance when carrying a pack, especially a pack of this size. Therefore, having padded shoulder and waist straps goes a long way in making this a pack that is easy and comfortable to carry. The mesh back band will also provide much needed ventilation and stop you from sweating too much when hauling your pack or meat after a successful hunt. An adjustable frame and waist belt mean that the pack is suitable by users of ranging height and size, eliminating the discomfort caused by carrying a pack that is too small or too big. Can be noisy: The pack is attached to the frame by way of clevis pins. Therefore, as you walk and move, the metal rings bump against the metal pins and produce a metal on metal clinging. This can be quite annoying and also counterproductive when going hunting. Pack can’t be used separately: Being able to use the frame separately is a huge bonus about this package. However, the downside is that the pack bag cannot be used on its own. The pack bag attaches to the frame by use of the clevis pins and therefore does not have any shoulder straps that allow you to carry it separately without the frame. Aluminum Frame; Weight: 5 pounds 2 ounces; Torso Range: 17" to 23"